St Tola Irish Goat Cheese is known as one of the premium artisan products in Ireland. 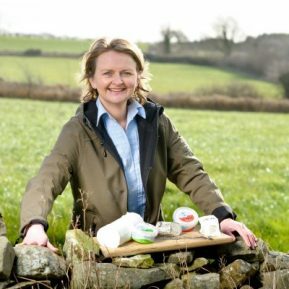 It is the finest, gourmet goats cheese and has been hand-made in the townland of Inagh just south of the Burren in County Clare since the early 1980s. The cheeses were originally made by Meg and Derrick Gordon who developed the fine quality of the cheese and helped establish a gourmet cottage industry in a rural area. In the late nineties, they were keen to retire and the business was taken over by their neighbour Siobhan Ni Ghairbhith in 1999. Over time Siobahn and her dedicated team have made significant developments to the family farm. Siobhn has developed the business from a local industry to an internationally recognised brand. The cheese, however, is still hand-made in small batches as the artisanal quality and provenance of our cheese is paramount. The farm receives French students every year from February to October from ESA College in Angers and Purpan INP in Toulouse. St Tola has been supported by Bord Bia, Department of Agriculture, Fisheries and Food, Clare County Enterprise Board, Teagasc, Limerick Institute of Technology (Research & Development) and LEADER – National Rural Network.